College is all about time management. With only 24 precious hours each day, we are constantly making choices about how to plan our schedules so that we can pass our classes and still make room for life’s important things: racking up kill streaks in Call of Duty, sinking jumpers at the MAC, and complaining about Ron and Sam’s dysfunctional relationship. When all the day’s hours are finally divvied up, I’m going to take a wild guess and say that, for most students, not much time is left over for attending Harvard sporting events. (If this doesn’t apply to you then you should probably comp The Crimson’s sports board this semester). For those of you who are only planning to make the trip across the river a few times this fall, we at The Back Page are here to help out. We’ve compiled a list of the top five Harvard sporting events to attend this fall so you can be a Crimson Crazy without spending too much time away from video games (or the library). No. 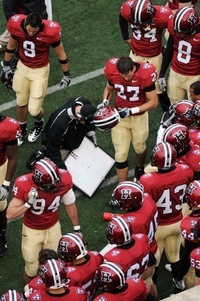 5: Football vs. Penn. Nov. 12, 12 p.m.
“The Game” may get all the hype, but if the past two seasons are any indication, the Harvard-Penn matchup will be the one that decides who takes home the Ivy League title. This year appears to be no different, as the Quakers and Crimson enter the 2011 season predicted to finish first and second, respectively, in the Ancient Eight by the members of the media. This time around, Harvard will have home-field advantage, as the two-time defending champs will travel to Harvard Stadium in November. No. 4: Men’s soccer vs. Northeastern. Sept. 4, 7 p.m. Fans looking to get in a few games before classes start to heat up should take a trip to the Soldiers Field Soccer/Lacrosse Stadium this Sunday for the men’s soccer team’s season opener. The lights will be on as the Crimson take the pitch against cross-town rival Northeastern. No. 3: Women’s soccer vs. Penn. Sept. 23, 6 p.m.
Talk about jumping right into the thick of things. The Harvard women’s soccer team kicks off its conference schedule against the reigning Ivy champions. And with only seven Ancient Eight matchups, an early loss would be disastrous for a Crimson squad seeking its third title in the last four years. No. 2: Head of the Charles. Oct. 22-23. While it’s not exactly clear how one should actually watch a crew race (are you supposed to run with the boats along the banks of the river or just sit there and watch for a few seconds as they pass by? ), the Head of the Charles is not to be missed. The world’s largest two-day regatta will be back in Cambridge once again this October. If rowing doesn’t excite you, never fear. There should be enough free ice cream and popcorn in the tents set up along the river to keep you happy. No. 1: Football at Yale. Nov. 19, 12:00 p.m. I don’t think this one needs much explanation, but being in the stands (or parking lot) for “The Game” is well worth the trip to New Haven. The stakes could be even higher than usual when the two squads meet for the season finale this year, as both squads boast championship-caliber rosters.